Catholic Women Religious have shown themselves as formidable and credible agents of social change in Africa by initiating, running, and funding numerous social service programs where governments have failed. How long will Women Religious continue to pick up the pieces where governments have abandoned their duties or rebuild what governments have destroyed? The prescription to this well known problem is structural change. The how is the core message in this reflection. Many of us remember that women religious in South Africa were actively involved in changing the Apartheid structures in the 1980s. 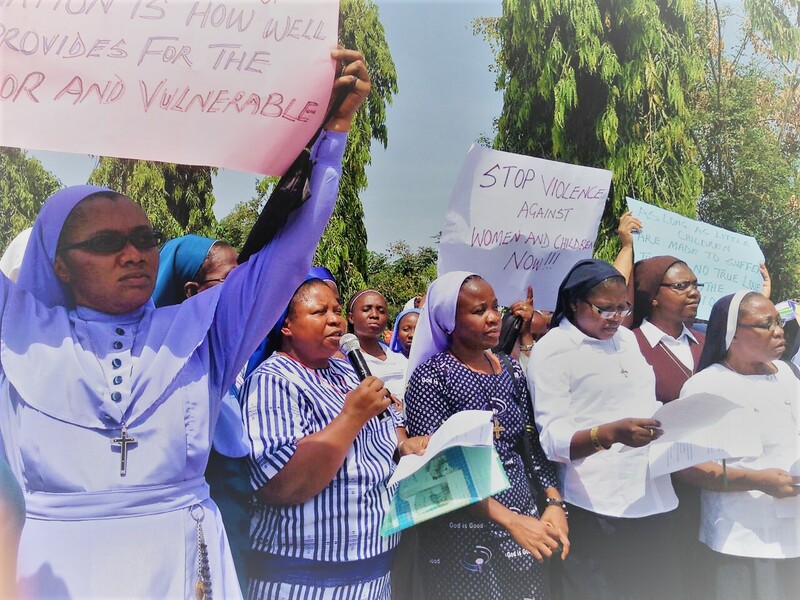 Already, a very small number of Women Religious in Africa are engaged in social justice ministry on a small scale, working either in their diocesan or parish Justice and Peace Commission offices. It is time for the sisters to play a more visible role in order to affect change which will bring hope to numerous victims of social, political, and economic injustice on the continent. For this reason, Africa Faith & Justice Network (AFJN) has initiated as part of its Just Governance campaign a Women’s Empowerment Project for structural change, starting by building the capacity of Women Religious in Africa. This will add to their service provision a much needed advocacy component to affect change at the root cause of the problems that have been hindering various communities. On May 26, 2016, AFJN began to implement its vision by holding a one-day Women Religious Forum in Abuja, the capital city of Nigeria. Over 60 sisters from various religious communities attended. The purpose of this one day forum, titled, Just Governance and the Common Good: Religious Vocation and Faithful Citizenship, was largely to establish the sisters’ readiness to actively and collaboratively engage in issues of injustice in that country. At the end of the gathering, those who attended the gathering recognized the negative impacts of injustice in society, the church, and their religious communities and unanimously expressed their desire to channel some of their energies beyond service provision into changing the structures that keep Nigerians in poverty and prevent them from realizing their full potential. They also acknowledged the importance of bringing their female perspective to bear on the socio-political life of the nation. In recognition of their limited capacity in social justice education and lack of advocacy skills, they requested the assistance of AFJN to enable them develop these needed capabilities. From November 22-27, AFJN held a five-day capacity building training funded by the Sisters of Notre Dame, Base Communities and the Hilton Fund for Sisters. The workshop, titled, Service, Advocacy and Change: Reverend Sister and Nation Building, was held in Abuja, Nigeria. Over 80 sisters from 25 religious communities attended the program. In a special way we want to acknowledge the presence of the sister from South Africa, Sr. Gugu S. Mbongwa (MSHR), the former president of the Nigerian Conference of women religious, Sr. Florence Nwaonuma (SSHJ), and the provincial of the Sisters of Notre Dame de Namur, Sr. Jacinta Oparah (SnddeN). Included in the November workshop experience was also a practical application of engaging government on issues of importance. On November 24, the sisters traveled to the Nigerian National Assembly with the goal of bringing their message to elected officials. Even though meeting requests to different officials were left unanswered, the sisters decided to take their message to them anyway. Unfortunately, they were refused entry to the National Assembly, but they held a rally and delivered their message of social justice to the National Assembly’s doorsteps. This practical advocacy day provided the sisters the opportunity to, a body and for the first time in Nigeria, address the issues of injustice in public in a form of protest aimed at the government and also in a form of education aimed at building public opinion and awareness. After all in a true democracy the power is for and by the people. Demanded that all states in Nigeria adopt and implement the Child Rights Act (2003) and the Violence against Persons Act (2015). At the end of the training workshop, the sisters were thrilled at what they were able to accomplish. To keep the spirit of the gathering alive, ten sisters representing different congregations and living in the six Nigerian geo-political locations agreed to form a steering committee to lead this new initiative Currently the committee is working to incorporate this movement as an advocacy organization to ensure legal standing of their future actions. AFJN will continue its mentorship until the time comes when the sisters are confident to stand on their own, carrying out their advocacy work to eradicate structures of injustice in the society at large. We invite you sisters to become the social justice leaders you are. We are hoping to expand this empowerment program to other African countries so that together we can engage those structures of injustice that keep our people impoverished. Please send our Women’s Empowerment Coordinator, Eucharia Madueke, an email at eucharia@afjn.org if you have any ideas, suggestions, or contributions. Now, it is time to get involved!